We provide structured and unstructured opportunities for Evaluation Roundtable participants to build relationships and interact around common challenges. Convenings are a centerpiece Evaluation Roundtable offering. They allow participants to dig deep on the substantive issues they rarely get a chance to discuss. 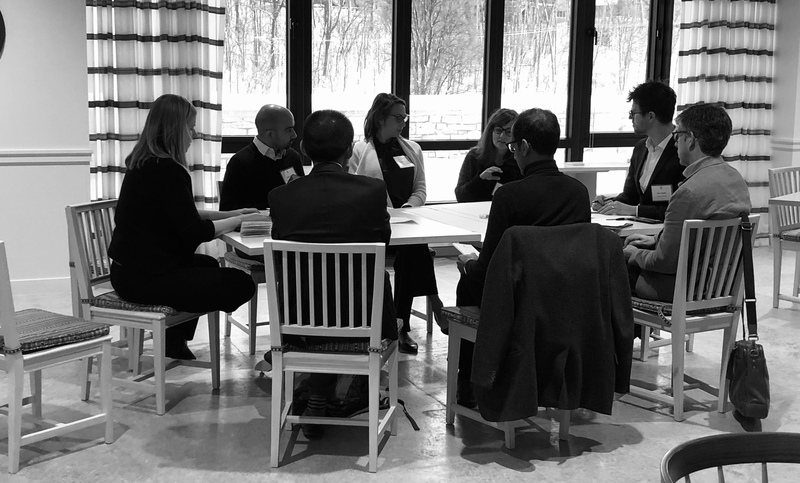 Unlike conferences where people listen passively or jump from topic to topic, Evaluation Roundtable convenings engage participants in lively, deep discussions that help them to gain new insights that they can apply in their work. We convene the large network in person every 18 months. Meetings focus on a specific theme. Attendees work together to address real-life situations they face in their work. We also convene smaller groups of network participants working on similar challenges. We commission and facilitate teaching cases. We produce cases that are factual stories of foundations’ in-depth experiences on complex evaluation issues. We commission teaching cases on important initiatives or strategies that shed light on the ramifications of decisions that foundations make about what to evaluate, when to evaluate, and how evaluations are used. Stories put readers in the role of decision makers who are confronted with problems and options for solutions as the story unfolds. They encourage participants to grapple with and find solutions to common dilemmas. We facilitate the teaching cases at our convenings and with groups of foundation evaluators and consultants. We research practices and pivotal issues about how foundations learn and improve. We explore how evaluation strategies, structures, and processes can get better. We benchmark evaluation practice in philanthropy and document issues so people can understand and debate them and make improvements. We raise up exemplary practices and the underlying concepts and practices that show solutions exist and can be implemented. We have a point of view about how evaluation practice in philanthropy should evolve. We offer commentary and thought pieces that encourage discussion and debate. Our research and work across many foundations give us a unique perspective on patterns and trends facing the sector. We start dialogues and debates to improve the field.